Trains Today: SNCF trip report 26-29 August - Why do we do this again? SNCF trip report 26-29 August - Why do we do this again? France is one my most frequented countries for rail trips. Is this because it is the closest country? Because of the classic locos and liveries? Or is it because SNCF make it such hard work that you always have to return to do the bits that you didn't achieve on your previous trip?! This trip probably falls mostly into the latter category. 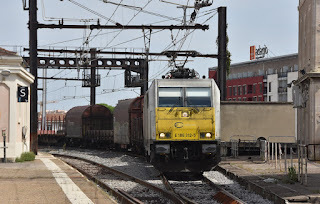 This was to be the third attempt to cover the Nimes - Clermont Ferrand 'Cevanol' loco hauled. Previously we had been thwarted by a strike in the PACA region, and then a rockfall on the line which sevoured it a year later. 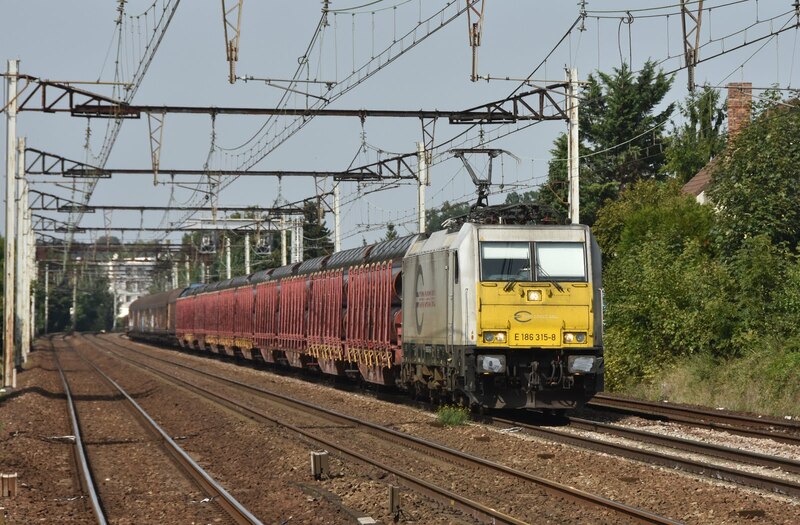 Another target was the route from Montlucon to Bourges where a unit had left our loco hauled plans in tatters last year. We had left things to the last minute with the last loco hauled run of the Cevanol being booked northbound for the day of our trip before units once again took over for the low season. 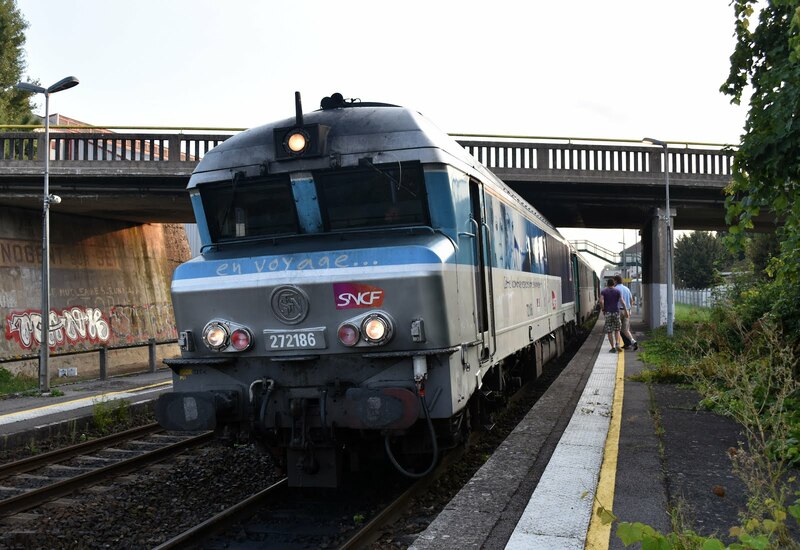 Before even leaving the UK we received the news that the locos would finish a day early- SNCF had blown our plans before we had even left the UK! Day one started with the traditional run to Paris via the Dover - Calais ferry. 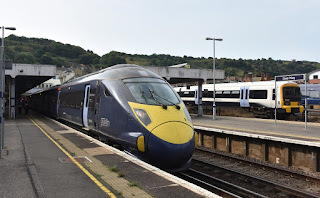 Engineering work in the UK made it an early start to get down to Dover in time for the 10:10 crossing with the 'Pride of Cantebury' to Calais. Foot passengers are asked to check in 60 minutes before the ferry departs and it did seem that this was around the cut off time when the buses left for the boat. One of the most bewildering moments of the trip was while on the boat when an older woman approached to ask 'Is this the way to the boat?'... Um.., you're on it! She seemed fairly clueless about the whole thing and was later observed to be very confused by the bus to the terminal at Calais. We took the walk from the ferry terminal into the city- the weather was great so we used our couple of hours before heading to Boulogne to have lunch sitting on the beach. Lovely. 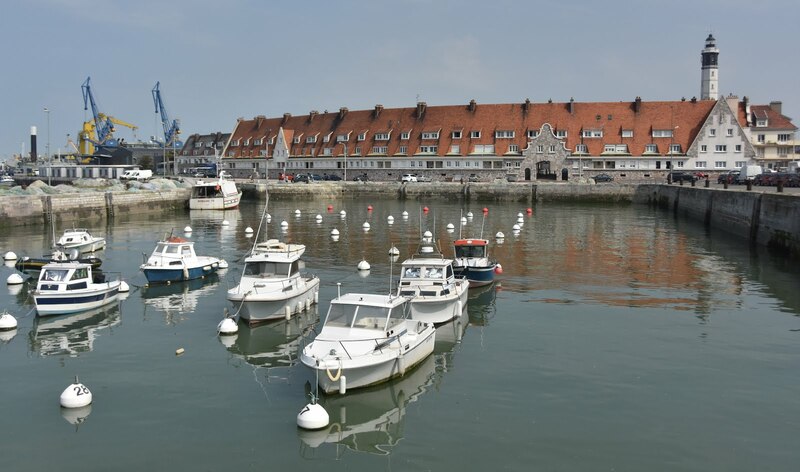 There are some nice bits of Calais, especially on a warm summers day! A very smart looking BB7399 is traction for the overnight. Another target of the trip was to travel the *entire* London - Paris route the traditional way- or as much as you can these days at least. 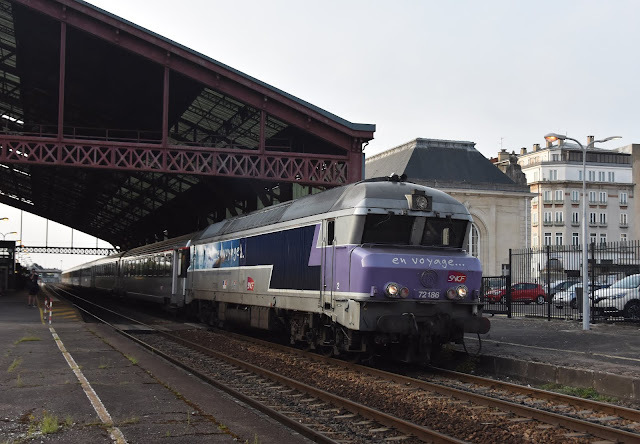 On arrival at Boulogne BB67582 was waiting to run around it's train ready to head south with the 17:33 Boulogne - Amiens. According to the diagrams this train should have two locos on a Saturday but I have never known it to have and was happy to have my solo winning loco. We gave way to a 'Ghost' BB22274 at Amiens. This was another route we had failed to cover throughout on previous trips so was good to get the full route in. 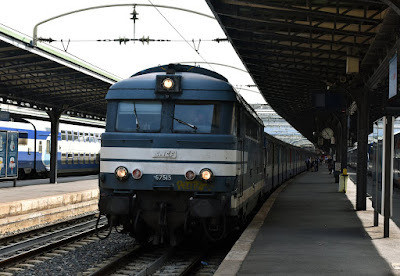 We had time to pop into the city centre for a quick dinner before heading over to Austerlitz for the 21:13 overnight to Port Bou- We haed planned to take this train in order to be in position for the Cevenol. Departure was more or less on time behind BB7399 . After Les Aubrais it was time to catch some sleep. We woke up in the Narbonne area behind BB7290. We were expecting a lovely sunrise but it was an overcast morning that greeted us. We had a TGV booked to get us back to Nimes for the 14:13 departure. Thanks to the advanced info from Charles Hinton (Thanks!) we were at least able to make a 'B Plan' which would avoid spending a lot of time on units up into the middle of France again. 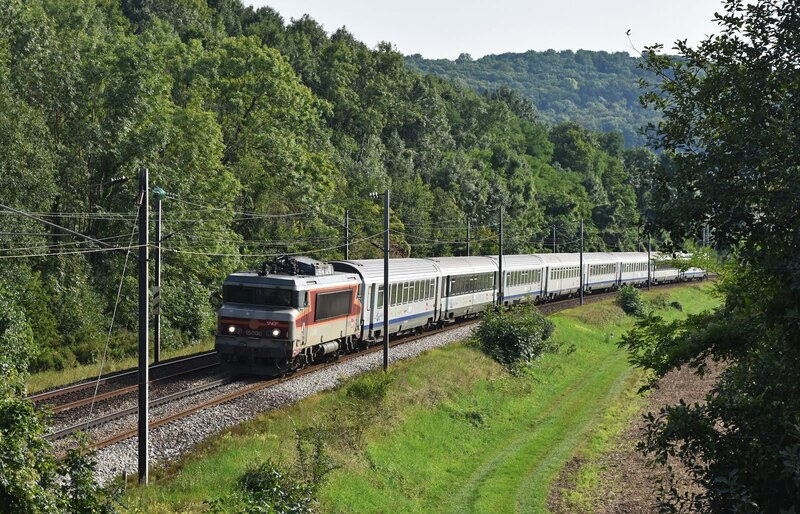 Our accommodation in Cleremont was cancelled and we found ourselves making a plan to head straight back up to Paris by TGV. The only problem was, being the end of the Summer holidays half of the French were also heading home with all northbound TGV's full- with these trains being reservation only this presented a problem (also good justfication for not making trains compulsorary Reservation only!). 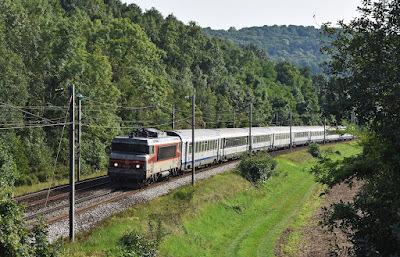 Eventually we managed to find a TGV which we could take back to Paris in order to head over to Paris Est for the last booked passenger run of the CC72100. 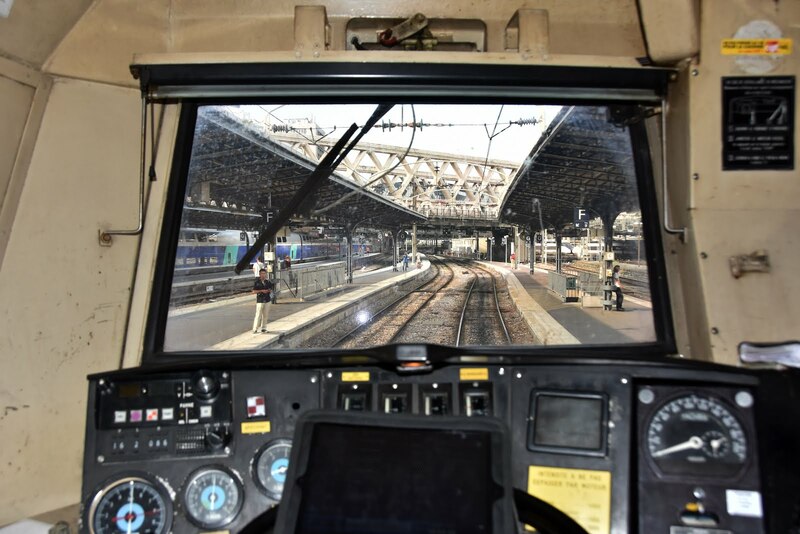 Cab view from CC72186 at Paris Est. There were plenty of enthusiasts at Paris Est waiting to watch the final departure from Paris which would be behind CC72186- not many however were on the train which ran without any fanfare at least as far as Troyes where we would disembark. This turned out to be a delightful town with beautiful old timber buildings- just a shame there will be no reason to visit now that the big diesels have gone! The end. 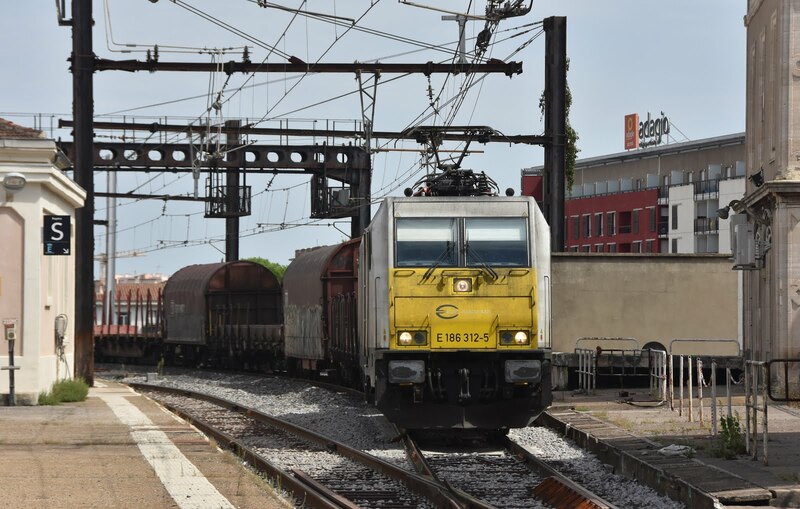 The very final booked passenger run of the BB72100; 05:14 Culmont Chalindrey - Paris Est on 28th August 2017 pauses at Troyes with CC72186 in charge. 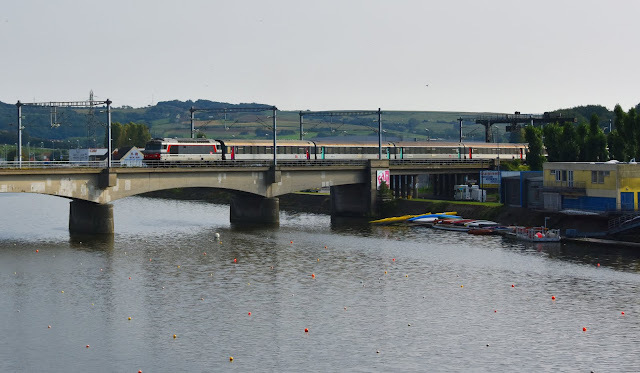 Alstom Coradia Liner trains will now work all services on Line 4. Breakfast reception at Paris Est! 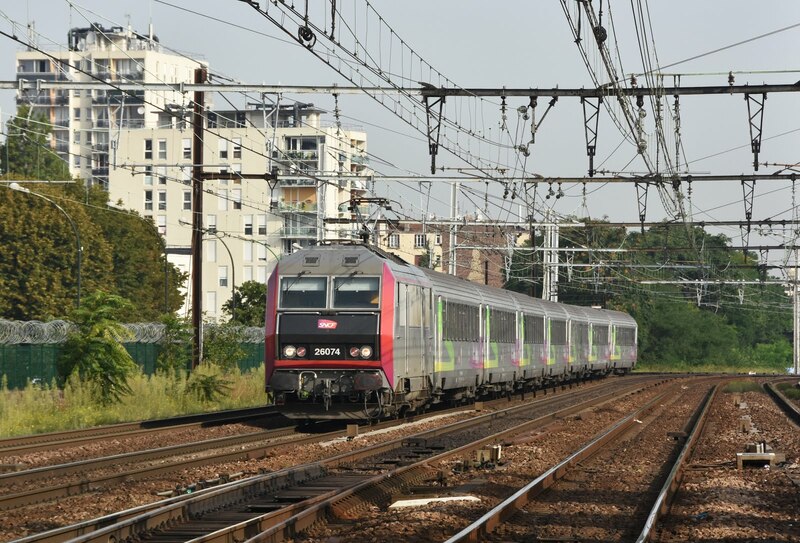 It was an early start ready for the 06:55 departure of CC72186 from Troyes (05:14 Culmont-Chalindrey - Paris Est). Again there were plenty of enthusiasts at the station in the first of the day's light waiting to see it go. Despite gen to the contraray we still held a slight hope that something big and blue (or at least with an original engine) might find it's way on to the last train. Of course the gen was correct and it wasn't to be. CC72186 carried no headbord or commermorative lable (it wasn't even required)- though a full breakfast buffet was provided upon arrival at Paris Est! That was it... the end of the Big Diesels and very sad. The weather however was very good so we got checked into our hotel (booked the previous night) near to Paris Est, dropped off our bags and head out for some photography. 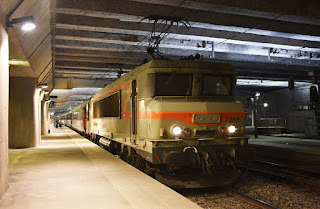 A plan was devised to get some afternoon photos on the traditional Paris Est - Strasbourg route with the classic liveried BB15000's, but first we headed south for some loco hauled trains out of Gare du Lyon and Austerlitz. We stopped off at Gare de Maisons Alfort Alfortville on the line out of Gare du Lyon before heading down to Le Vert de Maisons. We got a couple of good photos here in half an hour or so before being advised by 3 SNCF personel that photography was not allowed- This is probably the first time that I've ever had a problem with photography in France- fortunately I had my extract of 'Artical 7' with me which did at least explain what we were doing. 'Photography is permitted from public places' 'This is not a public place'- so that rather throws that theory into tatters. The staff weren't being particularly unfriendly but there was no point arguing further. 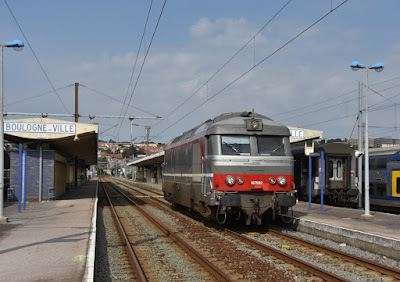 We continued by way of Villenuve St Georges (quickly discounted after an announcement over the PA said something about being on platform 1... that would have been us then) and then Juvisy where just one freight was seen, in a location we couldn't photograph. Back to the passenger trains and onto the lines from Austerlitz. 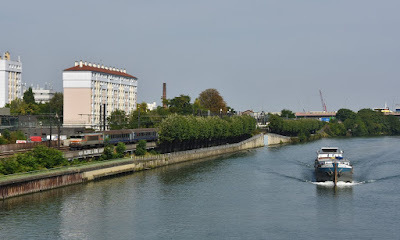 It turned out the shot from the Seine bridge at Choisy le Roi wasn't as good as we hoped- but a passing barge did at least play ball. 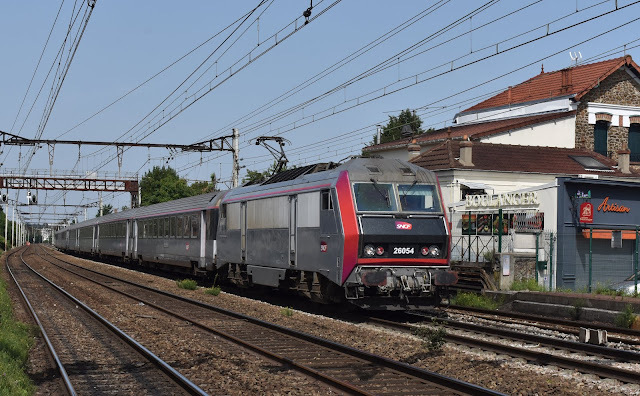 I then got confused by the RER timetable and nearly missed us the next shot- we were able to get back to the mainline but only to Choisy le Roi again, where we were unbelievaby 'bowled' by a pigion taking off right over the front of the Sybic we were trying to photograph. BB15008 in 'Grand Comfort' livery leads the 16:36 Paris Est - Bar le Duc. 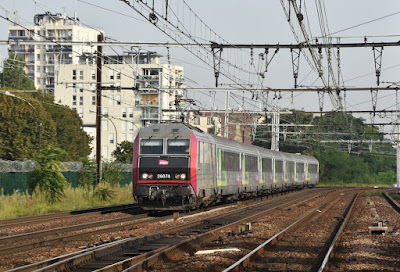 Ah well, on to Paris Est and the really sceneic shots- This very quickly took a bad turn when the 14:36 to St Dizier was sitting at Est with an AGC BiBi in place of the booked loco! 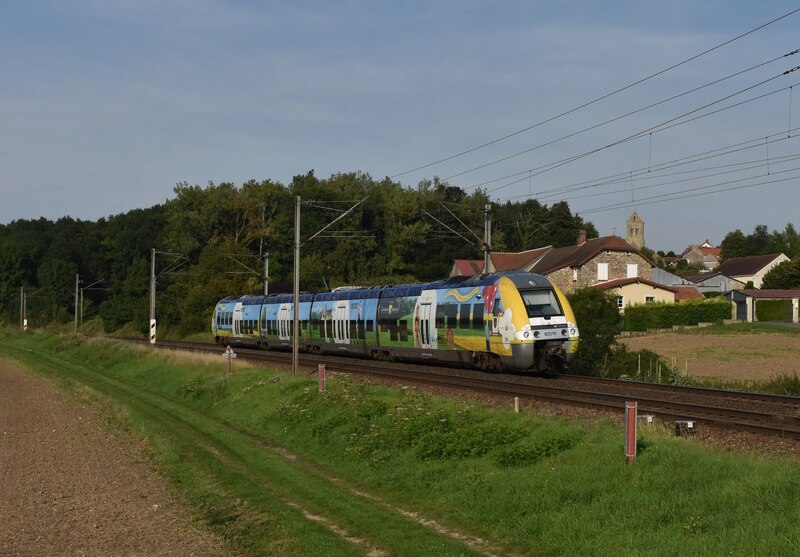 Not only did this mean taking our trip out to Chateau Thierry on a unit, it also meant that one of the three Paris bound trains we would be walking to photograph later in the afternoon would be a unit. It was indeed a long walk to Fossoy but the photos should definitely have been worth it. Unfortunately after BB15050 on the 15:37 St Dizier - Paris the following train the 17:11 Chalons en Champagne - Paris Est, which should have been one of the best shots of the trip, turned with another AGC BiBi! To say we were not amused would have been an understatement. With the knowledge the next train was also a unit we had a gap of 4 hours without a loco in the right direction... SNCF was really not being kind this trip! 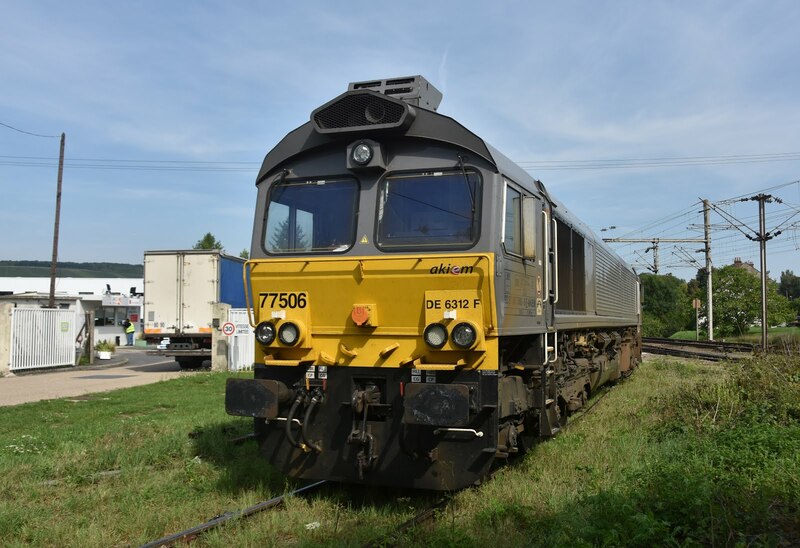 A solitary freight was photographed with Axiem 77506 on a grain train from Chateau Thierry- again the in the wrong direction for the light. After a somewhat disappointing afternoon it was time to begin the long walk back to the station (around an hour) but at least it now wasn't quite so hot. BB15008 was our chariot back to Paris before a meal was enjoyed by the slightly tired wanderers up in Montmatre. Perhaps tomorrow would be more fruitful for our photos!? 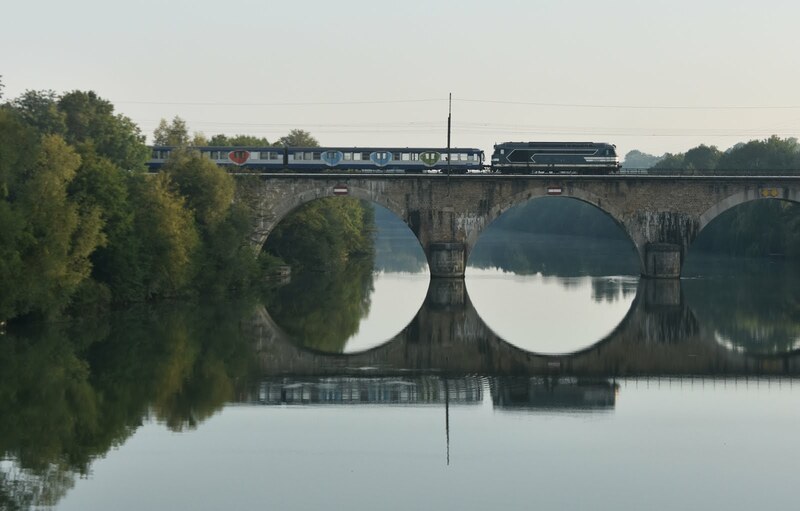 BB67515 crosses the Marne with the 07:18 Le Ferte Milon - Paris Est. It was up early again to photograph the 'tricky' Le Ferte Milon workings with BB67400. It would be dark for the first, but I had worked out that a nice shot should have been possible crossing the River Marne at Trilport for the second. Unfortunatley I had not realised when doing my research that www.suncalc.net doesn't work on a mobile device in portrait! 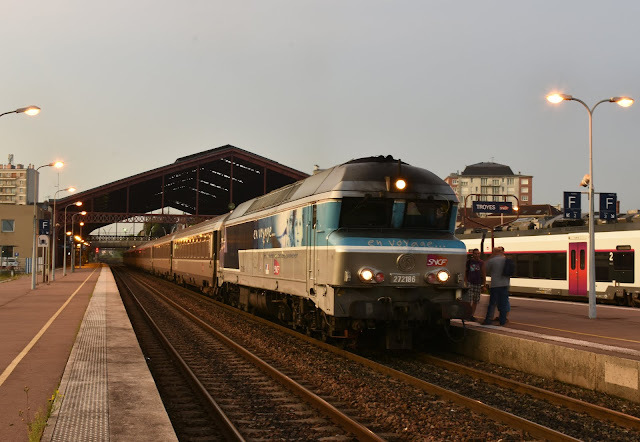 The light was therefore nowhere near where I had expected- had I not been so tired the night before I might have realised this error from the orientation of the map- still it wasn't a totally awful shot and BB67515 in blue was a fine sight on the 07:18 Le Ferte Milon - Paris. While the light was wrong this location certainly had promise and after heading back to Paris to check out of our hotel we were back again, now in much better light to try to make up for those BB15000 shot's we missed the previous day. The reward was much better with a perfect reflection of BB15002 on the 10:36 to Bar le Duc. BB15008 made another pleasing photo heading the other way though a boat had been less useful than the day before and had somewhat destroyed the reflection. 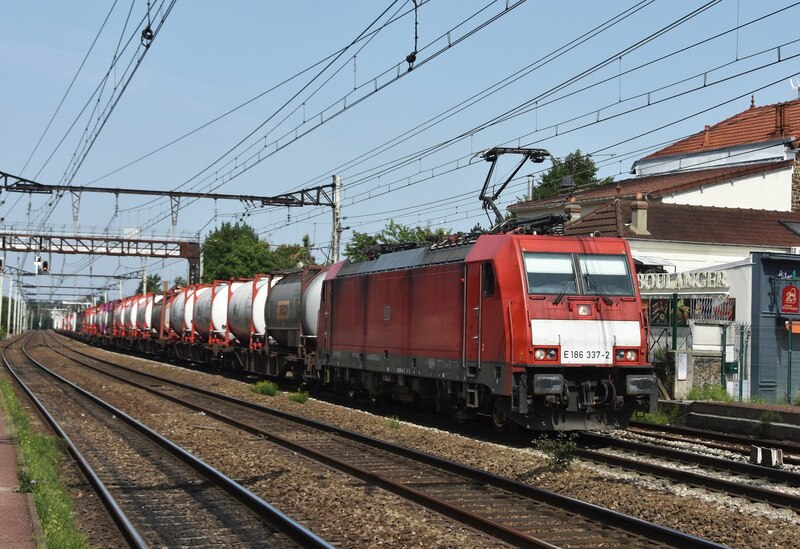 The start of a busy session at Saint Michael sur Orge with BB26045 heading south. 29/08/2017. One of several freights, E186 306 heads south. 29/08/2017. Happy with our haul we headed south again, this time to Saint Michael sur Orge on the lines out of Austerlitz. On my previous visit freight had been very disappointing but today we managed six trains in the 2 hours of our visit, the first hour being particularly productive. Freight travic levels are clearly very variable here and it is worth noting that all the trains seen were heading South (the way we wanted), add into the mix a couple of BB7200's and a few Sybics and it was a successful few hours. 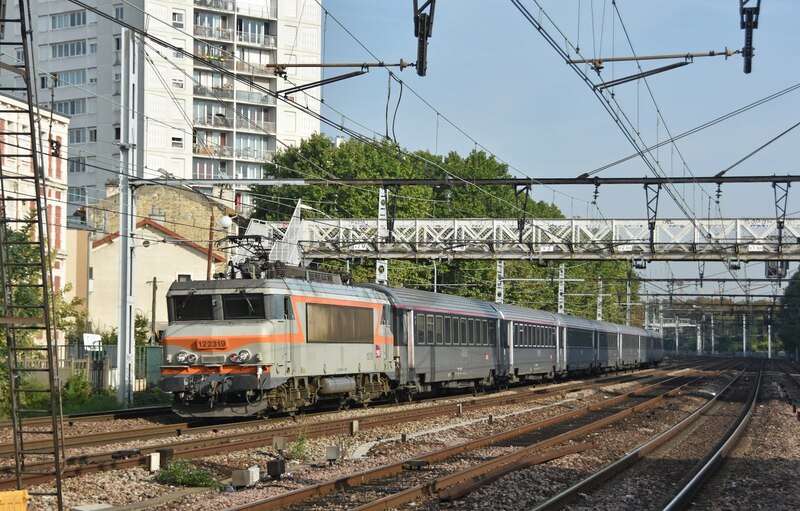 BB67515 waits for departure with the 17:05 Paris Est - Le Ferte Milon. 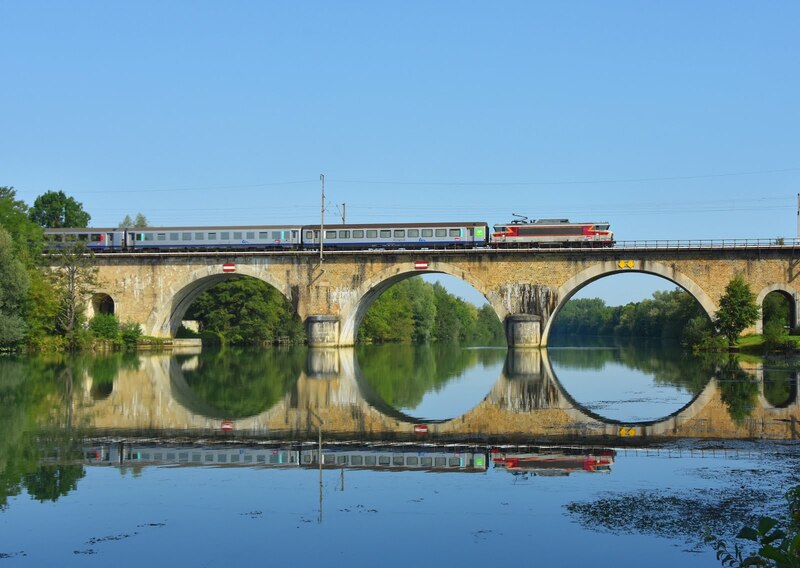 Thoughts would soon be turning to our Eurostar home but a visit to Paris isn't quite right without a ride on the diesels to La Ferte Milon. 67515 was in place for the 17:05, which was good as it was required. This was taken to Meaux loosing a reasonable amount of time on the way and only just connecting with the train back into Paris. We had seen three sets marshalled up with locos, two in blue and the other BB67451 in En Voyage. Knowing that we should pass the 18:05 just outside Paris we were keeping a keen eye out but didn't see anything. Back at Est the reason became clear with the 18:05 showing 20 late on the boards and annoucements suggesting some sort of problem in the Noisy le Sec area. Eventually the stock arrived with BB67451 and turned around very quickly departing (very slowly) some 30 minutes late. Had we not been on the 20:13 Eurostar home we could actually have covered both turns today. Either way, finishing with an opening window and a blue diesel isn't a bad way to end the trip. As we weren't rushing off the 18:05 there was even time for a spot of grocieries shopping and an ice lolly before booking onto the Eurostar in good time (very unusual!) for 374009/10 back to the UK. Chalons en Champagne - Paris Est in place of the expected BB15000. Why do we do this again? This has to have been one of the most frustrating trips to France to date. Fingers are being crossed that the Cevenol may run again next year- surely after three failed attempts we deserve to get this route loco hauled? The change of plan there also threw Bourges - Montlucon out of the window. It could have been covered later in the trip but with such great sunshine it felt a waste to spend so much of a day sitting on a train. I've not been aware of unit vice turns on the Eperney BB15000 turns, but then maybe I've just not paid attention before. This was very frustrating as were the hot muggy conditions we experienced throughout most of the trip. 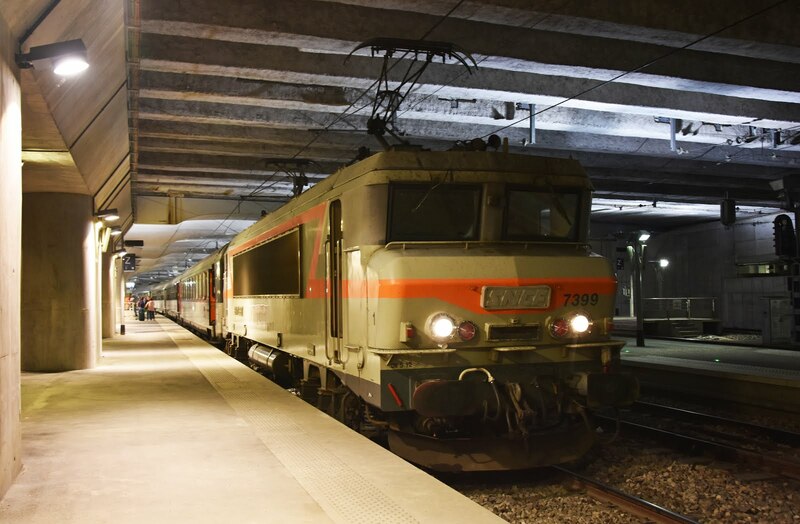 All that said- I always enjoy these trips to France and the classic 'Nez Cassis' locos - though sadly now only the electric versions. Once again this trip has added more to the list of things to go back to France for that we have failed to achieve. So when is the next trip?